​ Most are familiar with the famous bell curve describing the exponential population growth rising on the left side (A), reaching the peak (B), then the steep fall into the abyss on the right side (C and D). A similar curve can be drawn depicting throughput (total resource use) where resource use increases, reaches a peak then declines rapidly when the Law of Diminishing Returns and various throughput constraints set in. ​ Can we begin to imagine a different scenario? Imagination is like a muscle in that when used it becomes stronger and when unused it atrophies. New visions begin as a fuzzy impression devoid of details which coalesce into an image over time. This process is similar to painting or drawing a scene. In the beginning one might start with only the gesture followed by filling in the details. The daunting image of exponential growth can become overwhelming, however, what if we could change this image to evoke positive connotations instead? The first thing that would happen is instead of becoming exponentially overwhelmed the image could become exponentially uplifting and inspiring. An analogy can be demonstrated by two different paintings or drawings of a tree. The first is of a tree that has been around for a long time and has a thick trunk with shallow roots extending for quite a distance. At first glance the tree appears to be healthy, however, if we take a closer look there are dead branches, shelf fungi are growing on the trunk and branches, and there are holes where a woodpecker has been feeding indicating that insects have invaded the tree. The shallow roots can no longer absorb enough water and minerals to keep the tree healthy and prevent its demise because the land surrounding the tree has lost its ability to retain water. The tree has not been able to adapt to the changing conditions and has outgrown its carrying capacity. Even though it is taking in as much as it can it is still dying. Although this tree is still standing tall, one good wind storm and the mighty tree could be easily toppled. ​ The other drawing depicts a much younger tree, a tree much smaller but one that has vibrant growth. Since I am the artist I know specific details that those who are viewing may not first realize. I know that this tree can grow in many different conditions giving it a flexibility that the older tree does not have. 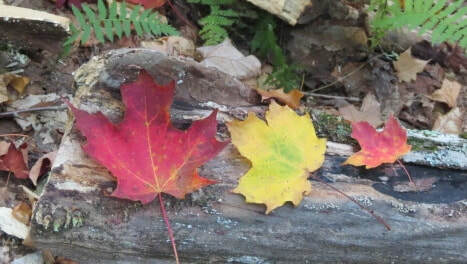 I also know that the root system pushes deep into the soil and absorbs minerals which are stored in the leaves and when autumn arrives the leaves fall, providing nutrients for the surrounding plants and insuring that diversity increases with time. This tree somehow knows that if it shares the resources available it has a greater chance of surviving. This inner knowledge is passed on, encoded in the seeds it produces, and future generations of trees can reap the benefits and again pass on encoded seeds. As we can see the picture remains unfinished just waiting for others to fill in the details. ​ In the spirit of these two images can we compare them to the challenges we face in today’s world? Population growth due to birth has mostly leveled off in the developed countries and on an individual basis is hard to have any influence curbing the increase in population in the underdeveloped world. Yet what we can do something about is over consumption. The amount of resources used per person in the developed world is dramatically increasing and this is something we can change. 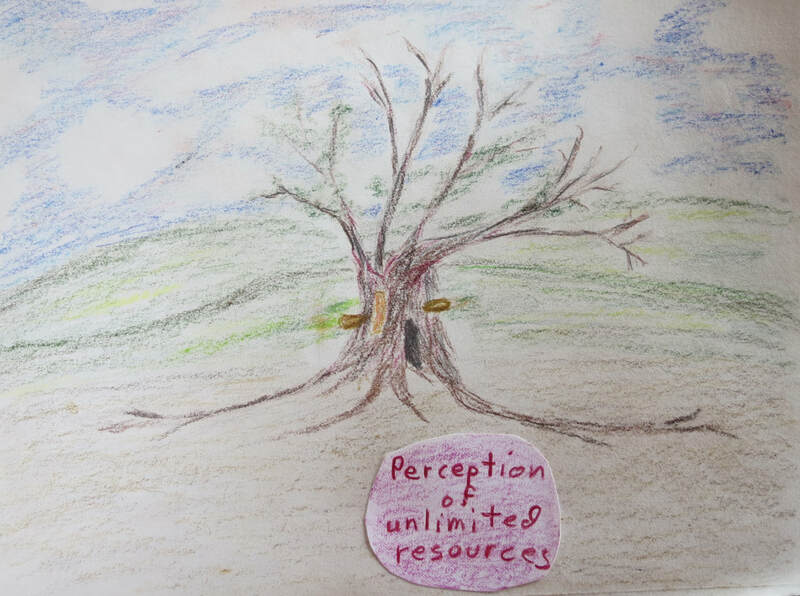 Referring back to the two trees and their very different root systems which is reflected in their growth and the future generations of trees, let’s consider the analogy of the roots as being our way of thinking. Now, can we change our way of thinking to meet today’s circumstances which includes the sharing of global resources? Can we include exponential growth of positive feedback loops that heal the Earth and its inhabitants for generations to come? Economically, countries have access to vast amounts of resources and how we use them will affect future generations. Looking around we see a rising number of disillusioned people with no hope and no future becoming homeless, using opioids or becoming incarcerated. To turn the corner this increasing segment of the population has to be inspired, has to gain the personal energy to invent their own future instead of visioning no future and becoming a burden on society. It is the root system that can give us indications on how this change might occur. Roots are responsible for the uptake of all of the water and minerals needed for growing and sustaining the tree, however, when we look at the tree most of the root system is hidden from us, buried under the ground. Likewise, when we consume a product we consider the object itself (energy such as electricity or gas is included) but often we do not consider everything that was utilized to manifest the object since it is hidden from society. If we could eliminate the object the unseen need for vast amounts of resources would also disappear. Since money is exchanged for resources costs would decrease allowing the disillusioned to have a better chance of a fulfilling future. This is where exponential growth appears in this futuristic painting or drawing. Talking with the younger generation I have heard many say that they feel they have no chance of starting out because of high debt loads and besides land and housing are so expensive, there is little chance of gaining in today’s world. Many then become part of the disillusioned. Making and promoting a low resourced based lifestyle would reverse this direction. Our society is spending itself broke trying to maintain our high resource based culture. Where is the money going? To the military to insure we have the resources to keep the system afloat and also to prisons, drug prevention and treatment, food relief programs and welfare programs. Is it possible to take some of this money to purchase eroded land that was depleted and is environmentally spent to allow willing participants to occupy and heal the land along the side of educators guiding them through the process? This would inspire many people and offer them a meaningful successful future. In this image edible forests are planted with plants that encourage diversity and that share the minerals promoting growth and reducing the need of fertilizers while starting to build the soil. As the land begins to heal and retain water there is a decrease in flooding and erosion. This plan can offer participants a purpose, an incentive to learn and gain independence, which reduces the burden on society. ​ Housing can be built in such a way that active participants increase skills and at the same time relish in what they have achieved. Through imagination, ingenuity and education their standard of living increases while their personal resource usage decreases. This image includes an ever increasing population of the disillusion all finding purpose stimulating a different kind of growth. If we look at the old tree that is dying it is in need of a high concentration of resources to sustain it while the second tree has evolved to be able to share and decrease its need for resources. As a culture we are living in a limited resource pool but are using them as if they are unlimited. 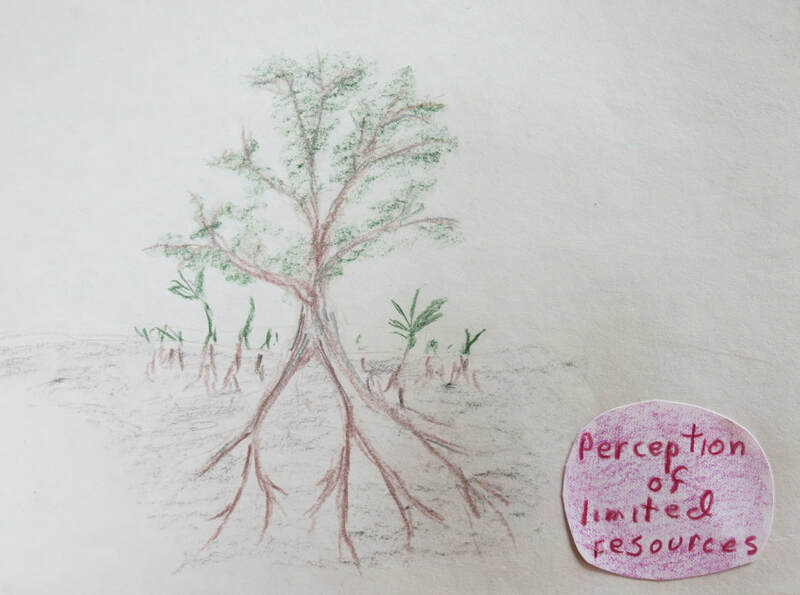 If we adopted another root system, one of limited resources, our actions would be quite different. Wasting valuable resources on war for our national security would no longer make sense. Our human waste disposal would change to a composting system and instead building ever complex septic systems we would have soil building compost. Living as a homesteading lifestyle we have composted our manure for many years and I often hear composting human waste only works on a small scale but not on a massive scale. We are a civilization that has landed on the moon, developed heart transplants and many other wonderful achievements too numerous to mention. Is it that we can’t compost human wastes on a large scale or there is no collective will? If we can start investigating a new root system we could grow in a new way, however, it would not look the same as today. With the changed root system the growth of the branches and leaves would be quite different. The future seems to be getting scarier, but perhaps it is not as scary as the change that needs to occur. We will have to wait to see.